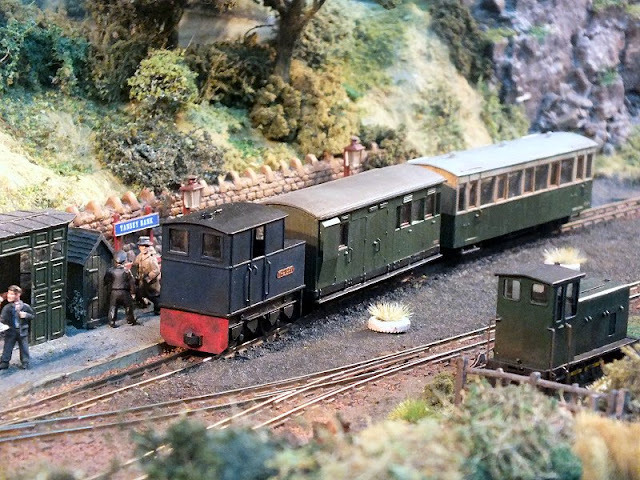 Once again Brian Guilmant rounded off a full programme of narrow gauge modelling events in the year by organising a special little event on behalf of both the Wessex NG Modellers and members of the 009 Society who live within easy reach of the community hall near his home in Colehill, near Wimborne in Dorset and who would like to bring their layouts along – as well as some who came from further out including Bob Vaughan from Watford, Tom and Lyn Snook from Mere, and Jim and Lyn Owers who came over from the Isle of Wight. Around 100 enthusiasts arrived from all points including as far away as Yorkshire and a sizeable contingent from the West Midlands. A great day in an informal and friendly atmosphere for all who participated or visited to enjoy with the added bonus of free guided tours to Brian’s fantastic home layout thrown in as well! As family matters precluded me being able to attend the 2013 Open Day, I was particularly looking forward to being able to get myself to Weedon Bec, near Northampton, this year for the 6th Group Open Day and was certainly not disappointed! Over 100 people paid at the door and there were no less than 17 layouts in various sizes and scales, excellent refreshments available all day from the hard working team behind the counter and as ever, a very friendly, informal and enjoyable day out amongst friends old and new from the narrow gauge railway modelling world. This biennial event has certainly come a long way since I attended the first one, on a very wet and miserable Friday evening in a small scout hut in Northampton 10 years ago. Keep up the good work guys, looking forward to the 2017 event with eager anticipation already! 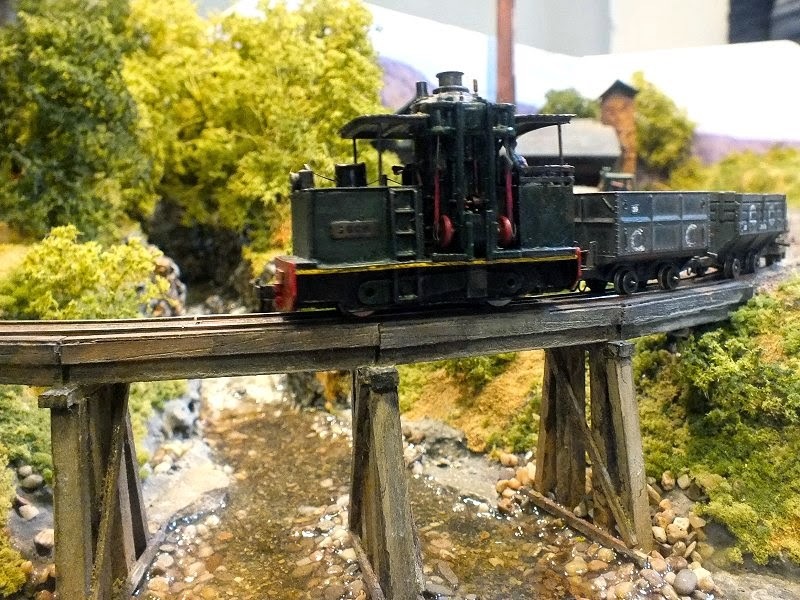 The last weekend in October again, and this time literally the last day and everyone who has Narrow Gauge railway modelling in their blood who is able to is, or should be, on their way to Swanley in Kent for the annual fest of all that is best in the hobby. 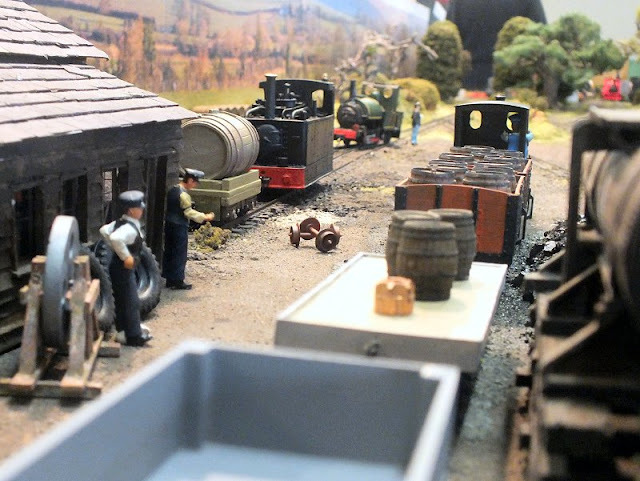 ExpoNG is thought by some to be a NG modelling trade show with a few layouts scattered between the traders; well I counted 23 layouts and this didn’t include some that were on trade stands, so I don’t think that charge holds any water nowadays, not this year certainly! Once again, it was a fantastic day out amongst about 700 like minded people and as far as I know everyone enjoyed themselves immensely, I certainly did. Long distance award this year went to Yoshiya Kobayashi and friends, who came all the way from Japan just to be there. There was so much to see that I have had to split this report into 2 parts, as I did in both 2013 and 2014. 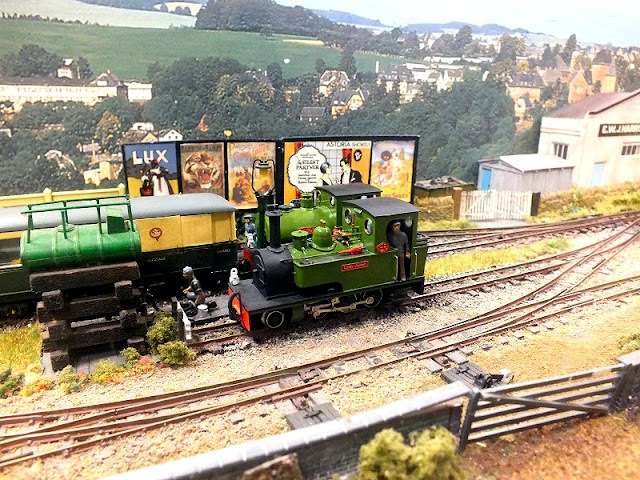 More splendid layouts to see, in a variety of scales and a variety of sizes, plus an extended collection of photos of the largest layout at the show. The Sussex Downs Group Evaleight Light Railway was assembled in its entirety for what we have been told was positively the last appearance in this form. Modules of this layout will be seen at shows again, but not the whole railway as it takes such a lot of manpower, time and transport to get it from A to B, so I thought it totally appropriate to take a larger than usual number of photos to give a tour of the system as a souvenir of appreciation to the Sussex Downs Group for a layout that has entertained for many years. I was especially pleased to be able to get to the M5/M50 NG Modellers open day this year as I realised checking my archives that it was back in 2012 since I last made it to this attractive part of Gloucestershire. The group, with support from a large contingent from the West Midlands Group, once again laid on an excellent show, with layouts in a variety of scales, 009 Society Sales, Secondhand Sales and Modelling Goods from the 7mm NGA, several traders, Shirley Harper’s craft stall for the ladies and the Webb Family Catering Corps providing 5 star refreshments throughout the day. In addition of course there was the friendly fellowship of like minded enthusiasts, both exhibiting and visiting which make these events so good. A very enjoyable day out and well worth the 200 mile round trip for me. Here’s my selection of photos as a record of the event. After 4 months of immobility as a result of breaking my ankle, I was at last able to drive the car again, so to celebrate the return of at least some mobility, my son and I headed up for a weekend in North Wales, which coincidently was at the same time as the 2nd Welsh Highland Great and Small weekend based on Dinas station. 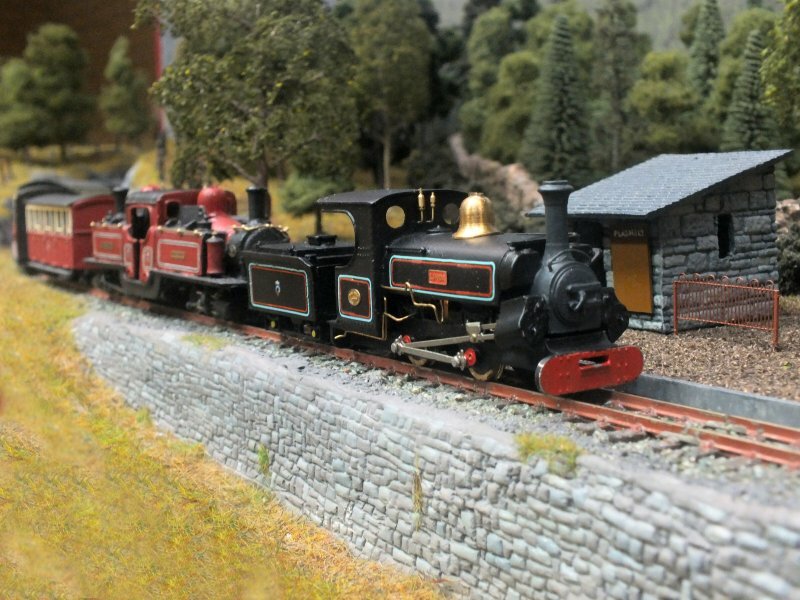 Outdoors there were all sorts of attractions including footplate rides, slate wagon shunts and Victorian train rides; whilst on the main line there were shuttle services between Dinas, Caernarfon and Waunfawr as well as the Welsh Highland service trains. 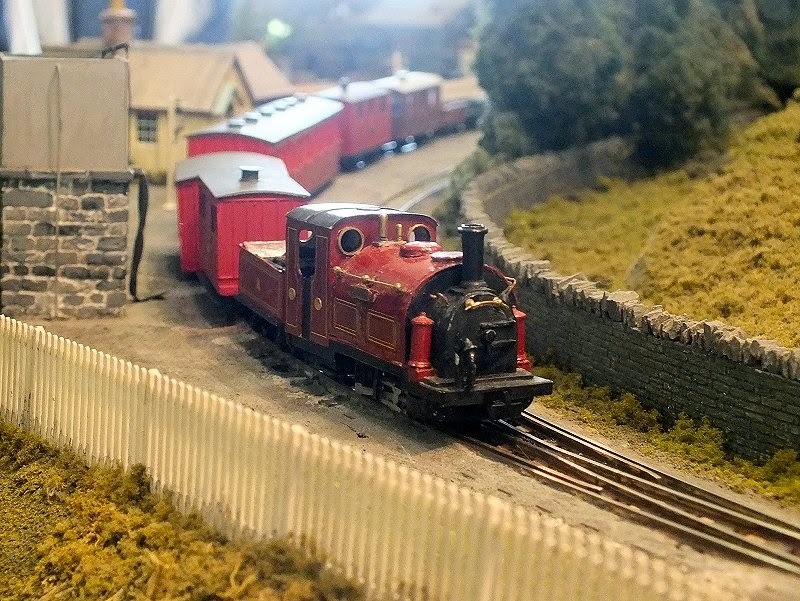 In the goods shed and hidden around various other small rooms were 14 narrow gauge layouts, mostly Ffestiniog or Welsh Highland themed, with 12 of the 14 being in 4mm scale. Great stuff and a great event! I made the journey home with indelible memories and will certainly return to North Wales sometime soon! 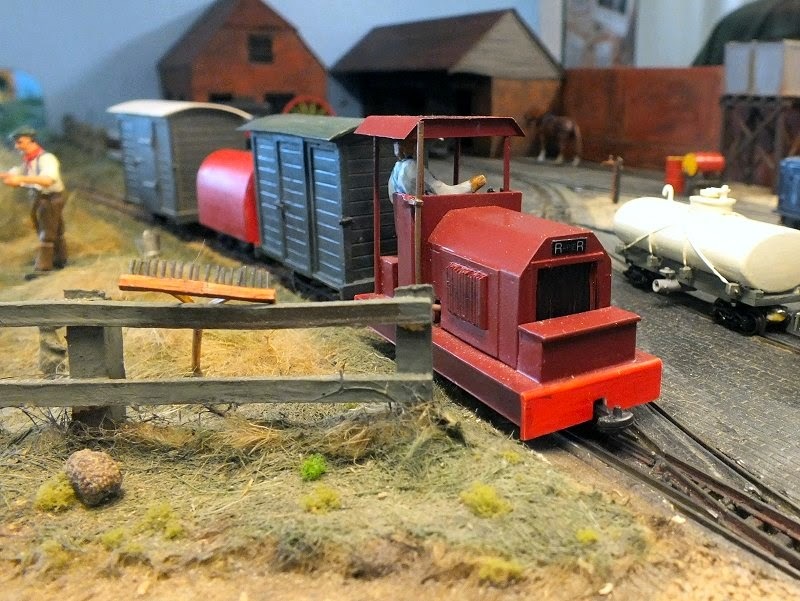 “Prepare to be amazed” warned fellow Wessex NG Modellers member Patrick Collins, when he organised a group visit to Statfold Barn. Understatement? I’ll say! Statfold Barn is literally a huge 1:1 scale narrow gauge train set, put together and of course owned by Graham Lee near Tamworth in Staffordshire. Privately owned and only open to the public on 3 special open day events in March, June and September each year, I can honestly report that if you haven’t yet been, it is something that you should put on your “bucket list” right now, and get yourself ready to not only be amazed, but if you have any narrow gauge juices flowing at all, a visit will, literally, blow you away! As I’ve been out of camera action and “absent” from the blog for 4 months now, I thought this was as good an opportunity as any, to celebrate my return to roving reporting! For the 10th annual Beds & Bucks NG Modellers Open Day. Mark Howe and his stalwart colleagues pulled out all the stops and took the risk of moving the event from its traditional January date to mid May. Did the gamble pay off? Well nearly 200 visitors plus around 50 or so who participated in one way or another certainly thought so and as we have all come to expect from this members day, it firmly re-established itself as one of the premier events of its type and is most definitely one that is “not to be missed”. I spotted modellers from as far away as Cumbria amongst the visiting enthusiasts (as well as Keith Fainges and partner who planned their holiday from Australia to coincide with the event). 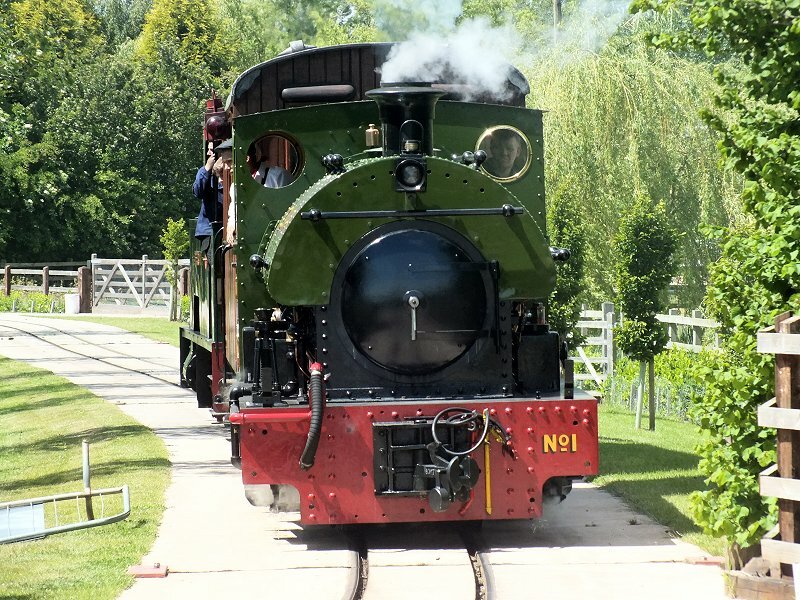 A great day out – superbly organised, great layouts, outstanding 5 star refreshments service and Very Friendly. I’m looking forward to next year already! This year, Stan Williams and his team pulled out all the stops! 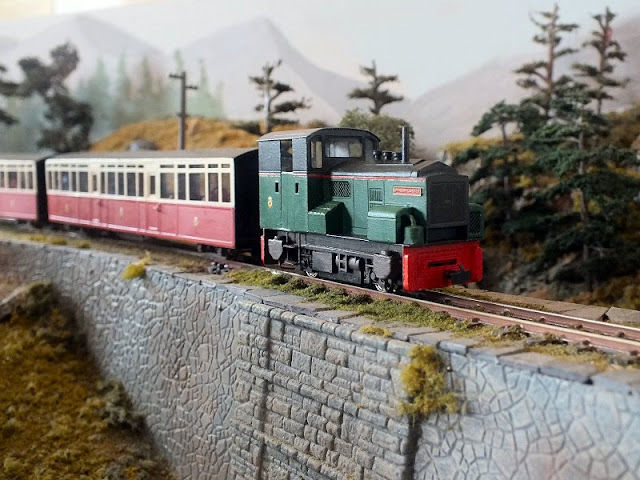 The unfortunate demise of Narrow Gauge North has resulted in the North being left a little thin on the ground at the moment for specialist narrow gauge modelling events, so Stan duly arranged for the use of the local Scout hall, in addition to the Guide hall procured last time, to supplement the two halls and corridor available in the original parish hall venue! Competing for space with a bicycle racing event and a wedding on the same day certainly made for interesting and colourful encounters on the short journey between the two sets of halls, which added to the carnival atmosphere of a really great day out (an 18 hour day and 500 mile round trip in my own case) and another super narrow gauge model event. Many thanks to all who were involved in organising the show. The Sussex Downs Group laid on their 5th biennial open day in the 5th different location since the first in 2007 - and this year moved away from the Haywards Heath area down to the coast at Lancing, to the very well appointed and suitable for this type of event in Lancing Parish Hall. 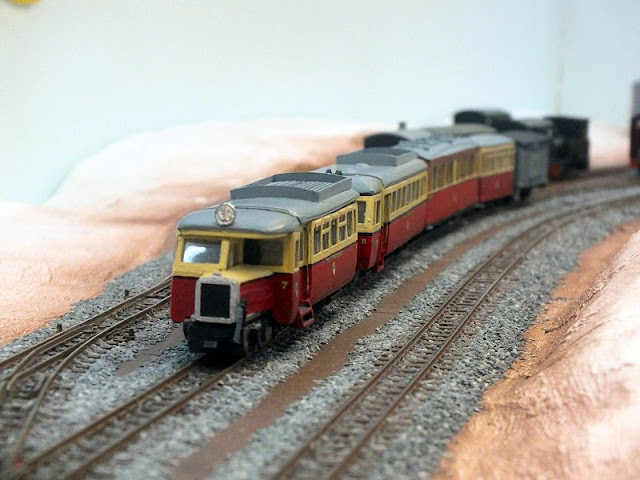 As always, it was a very well organised event indeed on all counts including a 5 star refreshment service, with 9 layouts, mainly in 009 and 2 in 0-16.5 plus trade support from Narrow Planet, Meridian Models, and the 009 Society Sales, Star of the show was undoubtedly Ted Polet’s small layout Nixnie which he brought all the way to Lancing from his home in Leiden in the Netherlands. I had a splendidly enjoyable day in Sussex as did everyone present that I spoke to. Very well done to the SDG team and see you in 2017 hopefully! 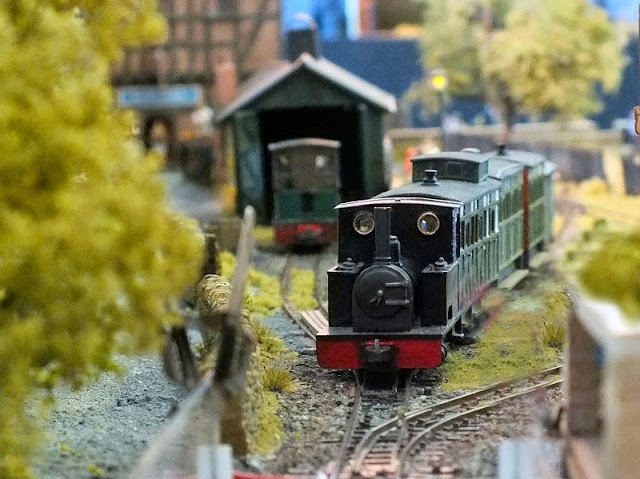 2015 got itself off to the now traditional great narrow gauge start to the year with the 9th annual South West 009 Society’s (SWOONS) members open day in the Merryfield Hall at Ilton, between Yeovil and Taunton in Somerset. If it ain’t broke don’t fix it is the watchword and once again, Geoff Bowyer and his team laid on a super friendly day and managed to shoehorn 10 layouts, 3 traders plus the full 009 Society sales roadshow as well as Matthew and Maria Cicquel’s 5 star refreshments into a small village hall without somehow making it seem cramped! 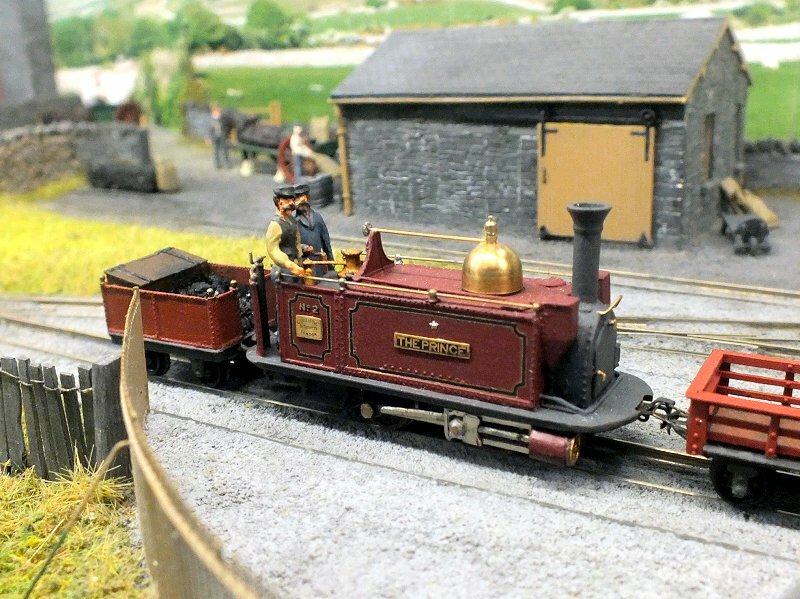 Those who do travel from far and wide in some cases to be at Ilton in January know that it is well worth the effort to get there and enjoy the special non-elitist fellowship of narrow gauge modelling in a relaxed informal and friendly environment. Kick yourself now if you didn’t go! Starting a new year, or finishing off an old one, depending which angle you look at it from, a couple of layouts and a visit to help launch a ready to run 009 loco that I didn’t manage to fit into any of my 2014 reports, but too good to simply let them fade away. First is a small selection of photos I took on a visit to Rod Allcock’s home in Devon to take some photos of his newly released ready to run 009 diesel loco “Dirty Doris”, which I can personally highly recommend as a super little model, then a flying visit to the Fareham MRC exhibition on the 5 October where members of the host club were exhibiting the splendid 09 estate railway Watt Estate and Patrick Collins with a couple of fellow members of the Wessex NG Modellers had brought Ryedown Lane to the show.